The Beverly Hills City Council on Tuesday night unanimously approved a Memorandum of Agreement and authorized its staff to issue permits to Metro to relocate utilities for the Purple Line Extension’s future station at Wilshire/La Cienega. This clears the way for Metro to move forward with its planned pre-construction work within the city’s borders. Metro will now be able to relocate water, power, sewer and other utility lines once a contractor for the Wilshire/La Cienega station advanced utility work is selected. Relocating the utilities now will ensure that area residents and business will be able to continue to receive service once actual construction begins for the Wilshire/La Cienega station. The Memorandum of Agreement clearly defines how the two parties will work together during utility relocation. The MOA is similar to established agreements Metro already has with other cities throughout Los Angeles County. The unanimous 5 to 0 vote is the result of months of close coordination between Metro and Beverly Hills. The City Council put the agency’s requested permits as well as its MOA through close scrutiny and public debate over the last eight months. City Council members expressed concerns regarding night-time work, noise, parking and local business impacts, among others. During the vote, the Beverly Hills Council publicly thanked Metro and its construction relations team for working closely with the city. Council Members reported that Metro came to the table, listened to their concerns and worked cooperatively through their issues. The approvals are welcome news to Metro and will help keep planned pre-construction work on track. Advanced utility relocation work for the other planned stations in the City of Los Angeles has been going on for the last year-and-a-half. In July, Metro selected a design-builder for the first section of the Purple Line Extension. The agency is now in a 45-day protest review period. Following the contract award, major construction would likely start next year. The first phase of the Purple Line Extension will extend tracks for 3.9 miles from the current terminus at Wilshire and Western to Wilshire and La Cienega. New stations will be built at Wilshire/La Brea, Wilshire/Fairfax and Wilshire/La Cienega. 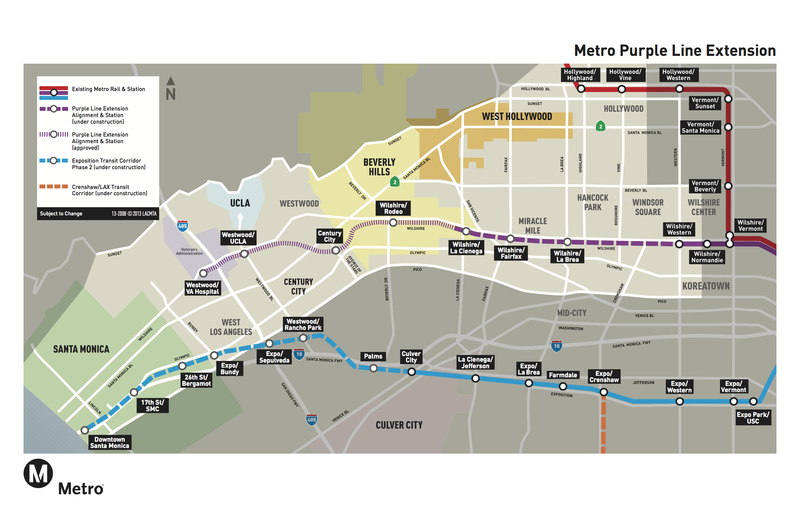 The second phase of the project will extend the Purple Line to downtown Beverly Hills and Century City while the third phase will include two stations in Westwood — one at Wilshire and Westwood boulevards, the other at Wilshire and the VA Hospital. The Purple Line Extension is being funded in part with Measure R, the half-cent sales tax approved by 68 percent of Los Angeles County voters in 2008. Gee thank you, City of Beverly Hills, for graciously not being an obstacle to utility relocation! It would be more delightful to see cooperation as good as Beverly Hills has chosen.